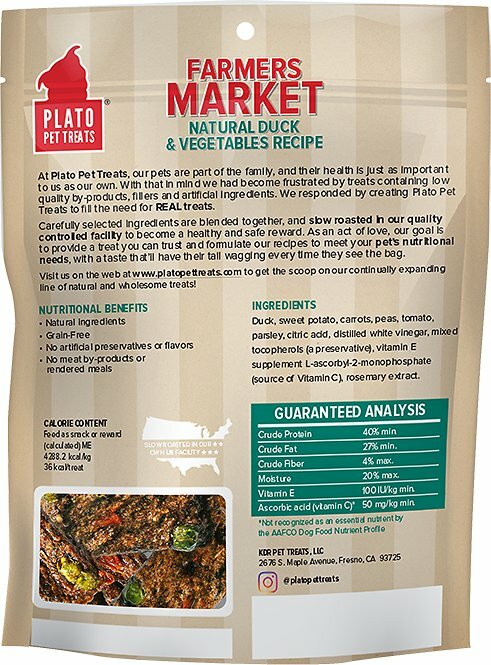 Plato Farmers Market Duck & Vegetables Grain-Free Dog Treats deliver that homegrown quality you love to your dog. 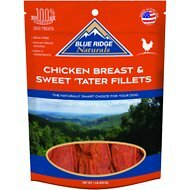 They are made with the freshest, all-natural meat and produce. They feature peas, carrots, tomatoes, sweet potatoes and parsley, slow-roasted for a healthy and delicious snack that will keep your doggies tail wagging! Duck, Sweet Potato, Carrots, Peas, Tomato, Parsley, Salt, Citric Acid, Distilled White Vinegar, Mixed Tocopherols (A Preservative), Vitamin E Supplement, L-Ascorbyl-2-Monophosphate (Source Of Vitamin C), Rosemary Extract. Feed as a treat or reward, as a part of a healthy diet. For smaller dogs, break into bit size pieces and monitor consumption. Always provide fresh drinking water for your pet. 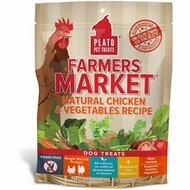 I purchased Plato treats because of the other reviews. I will add my review in support of the other comments. My Vizsla either loves a treat or won’t eat it, and he loves the Duck recipe. I plan to order other flavors today. Also, in agreement that it is easy to break up, so I use it in his treat ball when we go out. Try it, I don’t think it will disappoint! These treats smell good, and my pup agrees! They’re easy to break into smaller pieces, but are not crumbly. Quality product that my Catahoula begs for. My two really like these. I got the turkey and cranberry treats from Plato as well, and they love those too, but when I give them one of each they always eat the duck treat first. They practically inhale them as fast as I set them down. 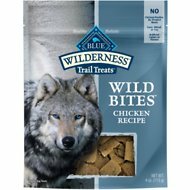 All four dogs LOVE these! I'm ordering more as we speak. Cameron loves these! Gets somewhat sassy about it !! My dogs love the taste. I appreciate how healthy it is. When you first open the bag, it STINKS! But the corgi loves it so much that I had to repurchase. They're great for training and very easy to break up without leaving crumbs behind. I'm not kidding when I say he can smell it from miles away and starts running for these. He is a lot more motivated in learning new tricks with these treats. One con is that I purchased a bag in Nov and the expiration date was set to Jan. Only 3 months to eat these treats. Maybe it is due to the viable bacteria ? Wished they had a longer shelf life.